Okay, now for some fun. A while ago Skywave released this kit PZ01, a modified Kongo Class DDG that is popular in a Japanese comic strip cartoon called "Zipang". The fictitious ship, Mirai, DDH-182 is the third ship in the Yukinami type Aegis helicopter destroyer. 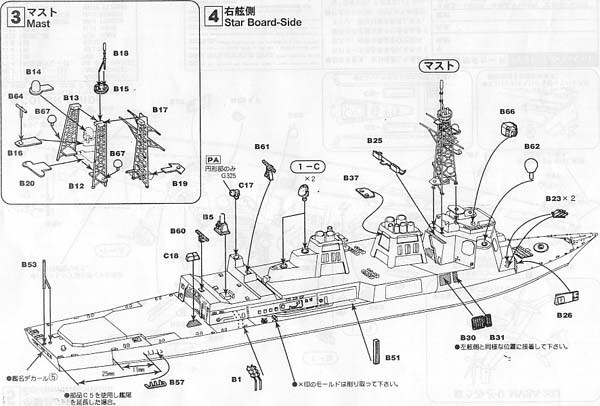 The premise of the cartoon is that the Mirai is transported back in time by a strange mysterious rainstorm and makes radar contact with the Japanese combined fleet, which is lead by the battleship Yamato. The destination of the combined fleet is Midway Islands. Sorry that is all I know about the comic, sounds very interesting. The new aft superstructure covers up the aft Mk. 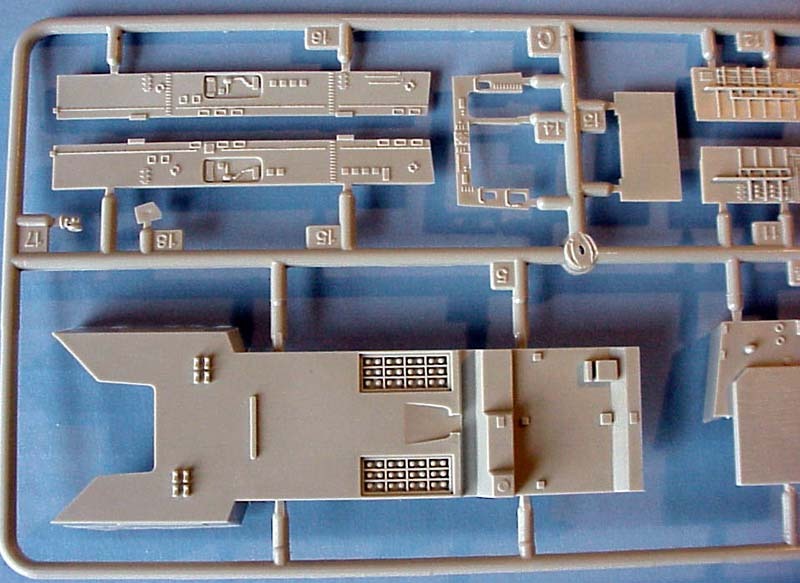 41 VLS and if you intend to model the ship with the hanger doors open you will want to remove the molded-on aft VLS as it will be visible. This information is not contained in the instructions, well at least not in English. 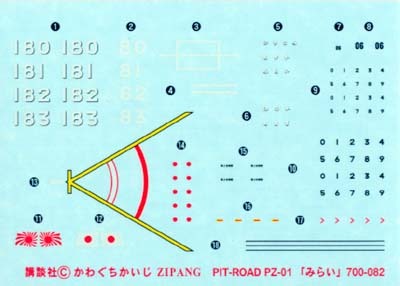 There are quite a few items that appear to need to be removed, (hint: they have an X across them but once again there is no Remove Symbol or English text, just Japanese text). To be fair, the market for this kit is the Japanese public, not English speaking countries. 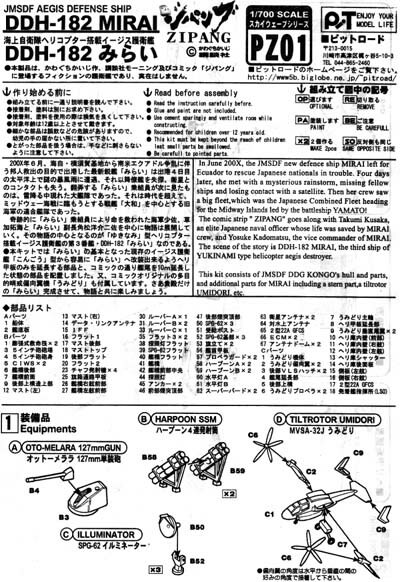 The instructions contain some English but there are plenty of Japanese text only sections which leaves one guessing as to what they say. 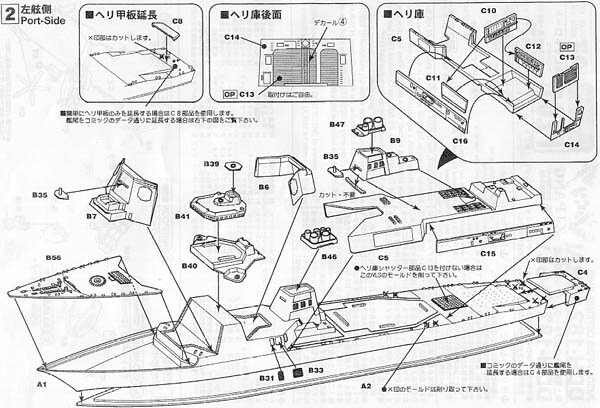 With the pictures contained in the directions, careful dry fitting of parts and some common sense there is enough to successfully build this kit. 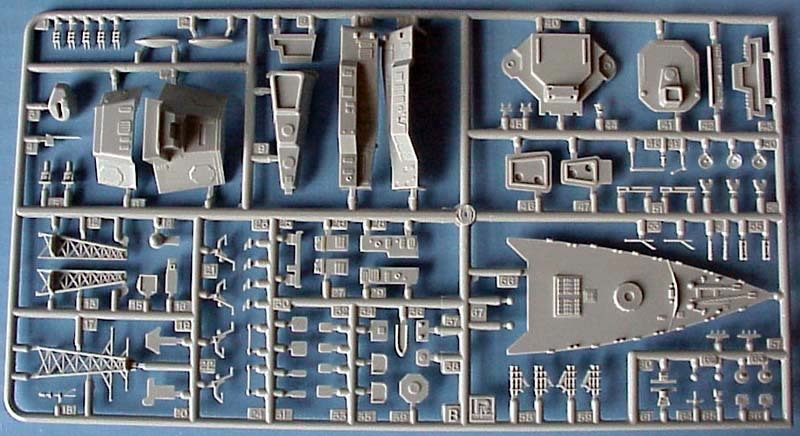 Unlike other Skywave kits this one does not have any information on the back of the box; instead, a separate black & white sheet has been added to detail painting, decal and other specifics of this fictional ship. The box itself is not standard Skywave as the top comes off much like Tamiya boxes. 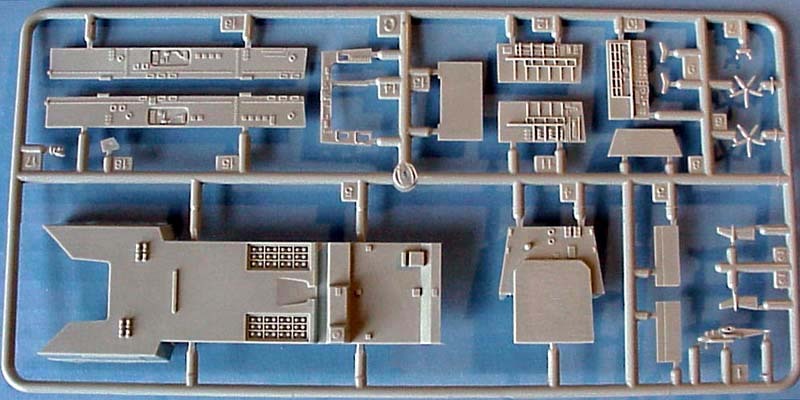 There are decals for the ship, helicopter landing markings, for the MVSA-32J and a Seahawk helicopter, which is not included in the kit. The decals are typical Skywave quality. Just in case you wanted to build all four ships of this fictional class decals are provided. 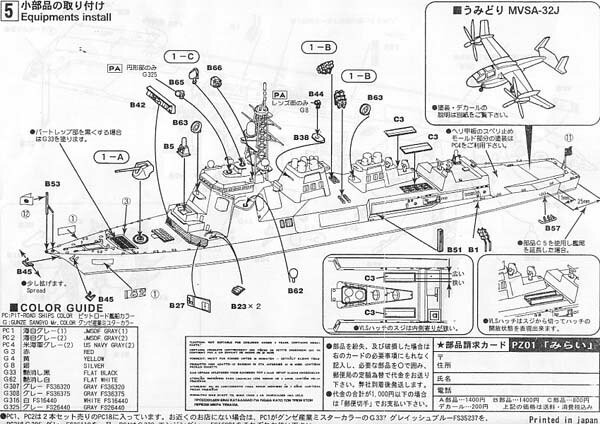 This looks like a fun kit to build, and until someone comes out with a USN Flight IIA Burke this is the only Burke/Kongo variant with helicopter hangers. 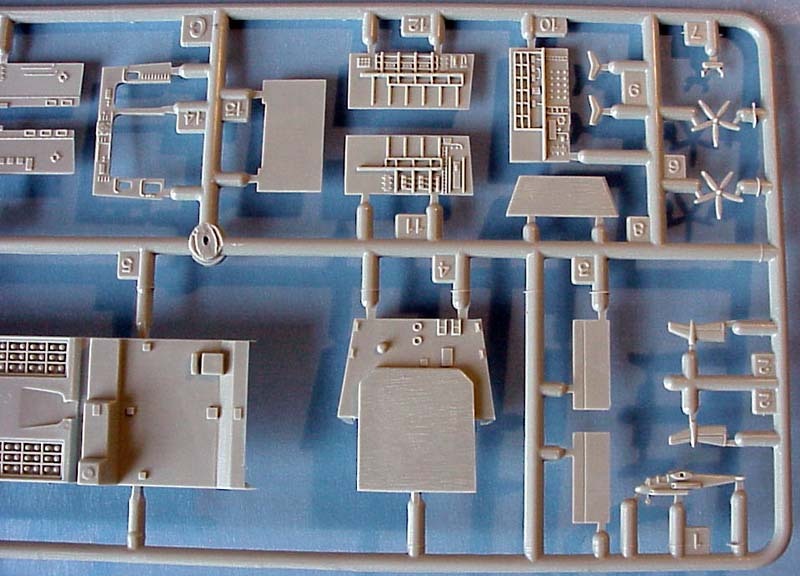 Build this wonderful kit and place it next to your Yamato in a diorama, what a site! !